facing the ocean in Maravilla resort. Near the pool and only steps to the beach. Free wireless high speed internet. Small dog pet friendly! Beach service included (Umbrella and 2 chairs). Sleeps 7. Perfect Poolside Place is made even more perfect by a total renovation in April 2019.
neutrals and pastels make this space even more inviting. Step outside the condo onto the patio, which is only a few steps from the south pool. where you will be treated to free beach service from March 9 to October 31 in 2019. Two beach chairs and an umbrella will be set up for you each day of your stay. on the large flat screen, or cruise around on your iPad. Wireless internet is fast and free for our guests this property. Welcome to your Perfect Poolside Place at Destin Florida! 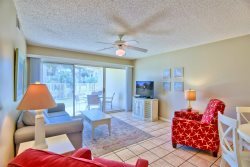 Book online now to schedule your 2019 beach vacation. "We enjoyed our stay at Maravilla. It was the perfect 1st vacation for our 1 year old Yorkie. The ground floor was wonderful for potty breaks and easy access to pool and ocean. " Kathy had this to say, "Very efficient and easy to book, thoughtful in sending helpful reminders before check in and check out. 2110 is by the pool and steps to the ocean! Nice grills out front and the pool is always warm and clean!" Courtney, who stayed at pet friendly Maravilla 2110, had this to say about her experience: "The place was perfect! The location, the view, the proximity to the beach entrance and I was able to bring my fur-baby.. Thanks for being a great host and hopefully I will return soon."